Santa Monica Travel & Tourism’s (SMTT) annual sales mission drew to a close on Wednesday, 21 November in Auckland, marking the end of a diverse lineup of activities to celebrate Australia and New Zealand being the number one inbound market into LA’s beach city. During the roadshow which began Monday 12 November, SMTT and hotel partners met with more than 20 agencies and held three events for trade and trade media in Melbourne, Sydney and Auckland. The mission was attended by Todd Mitsuhata, Manager, Asia Pacific & Latin America for SMTT, Dustin Hess, Director of Sales & Revenue Management for Hotel Shangri-La and Gerry Peck, General Manager of Shore Hotel. In addition to honoring the support out of the Australia and New Zealand markets, the mission was also an opportunity to highlight all of the latest developments from Santa Monica. The mission kicked off with a trade event for 30 key industry professionals at Ezard in Melbourne, one of the city’s best fine dining venues with 2 chef hats – tying in with Santa Monica’s reputation as a destination for foodies, with more than 400 restaurants in the compact city. In Sydney, 65 trade partners and trade media attended a luncheon at The Guest House, Park Hyatt, located opposite the water and mirroring the water views of many of Santa Monica’s 40+ hotels that are located opposite the Pacific Ocean. To conclude the roadshow, 30 key industry partners enjoyed a farm-to-table style meal at Fish Hilton Auckland positioned over the water, with four weekly farmers markets, this type of cuisine is found readily available in walking distance from Santa Monica’s long stretch of beach. United Airlines and Air New Zealand participated as airline partners for the trade and trade media events in Melbourne, Sydney and Auckland. As part of the major prize, each airline partner gave away return flights for two to Los Angeles International Airport (LAX). Hotel partners, Shore Hotel and Hotel Shangri-La also gave away four nights accommodation, making the prize highly sought after. 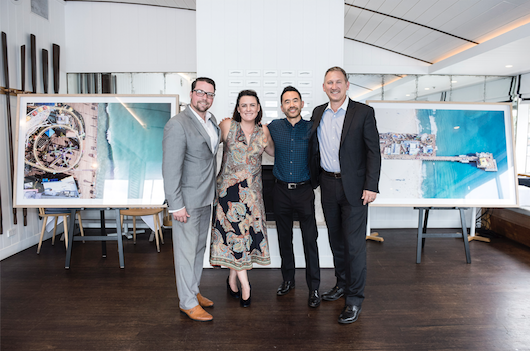 Santa Monica Travel & Tourism and hotel partners also hosted a media event on board the Majesty One World Super Yacht, the newest yacht on the Australian charter market. The day started with a yoga session on deck taught by Santa Monica trained instructor Skye Griffiths, followed by a healthy gourmet brunch from Chef Guy Turland, founder of Bondi Harvest, a popular café in Santa Monica known for its locally sourced ingredients. Guests sipped on mimosas whilst cruising around the picturesque Sydney Harbor, unwinding body and mind in true Santa Monica style. Santa Monica Travel & Tourism is the official tourism body for Santa Monica; Los Angeles’ vibrant beach city. Santa Monica is set along a beautiful 5.5km stretch of coastline and offers the quintessential Southern California beach experience. With award winning dining, incomparable hotel collection and famed shopping options, Santa Monica is the ideal place to soak up the California lifestyle on holiday.